When my friend, Ruth, landed a full time job after 15 years as a free-lance writer and at-home mom, seventy percent of me applauded the new move. The other thirty percent felt like it was in an elevator that had disengaged and was falling through a hundred story shaft. "Maybe we should talk about what my new job means for you," she had said, noting my poorly disguised bewilderment. "Oh, I'm sure there are going to be some major adjustments in your household," I answered, neatly dodging her overture by turning the focus back to her. Yet, I had to wonder privately: What about all of this was making me so uncomfortable? It wasn't as though Ruth were my oldest and dearest friend. In fact we had met only three years prior. Yet we had so much in common that the friendship took off immediately. We had both studied anthropology, and were interested in writing. We had both always worked part time after our children were born. We had both made and kept the choice of putting our family and household center stage as opposed to work and career. So it was natural to get a phone call from Ruth at 8:45 on a weekday morning, while she made beds and I washed breakfast dishes. Our conversations ranged from the sublime to the mundane: "I won't be able to make it to that world hunger meeting you've organized....I've got to tell you about the tantrum my son threw last night....Oh, and do you have that recipe for pumpkin soup?...We never finished that conversation about God...."
We were unapologetic about our frequent lapses into banal banter. We agreed that due, in part, to the isolated nature of "housework" (for lack of a kinder euphemism,) women have always needed to meet to exchange information and discuss their troubles. In traditional village life it was by the well where they drew water or by the river where they washed clothes. When I had babies and toddlers we met at the playground, chewing the fat around the sandbox. Now our older children were at school. And given the modern convenience of running water and the fact that we lived at opposite ends of the city, our portable phones were the best means of "meeting down at the well." Even my husband enjoyed this metaphor, and when Ruth would call, he'd tell her, "I can hear that water running in the background." Yes, my morning telephone companion would no longer be available, but was that all there was to this? I began reconsidering the old work-at-home vs. out-of- the-home discussion -- by now, an old and familiar mantra. Admittedly, when my first son was born I did not interrupt a high-powered career to stay home. I had finished my master's degree in Sociology/Anthropology. Uninterested in the option of pursuing an academic career, I taught English as a Second Language, waiting for a better idea to come to me. It was convenient to teach part time, mornings or evenings, while I had my other two children. I could quit and start at my convenience, or take the summer off. As I watched those women go back to full time jobs, their lives looked inordinately hectic. Knowing that raising children would probably prove the most meaningful experience of my life, it seemed ridiculous to rush chaotically through it. This of course was validated by the reality of the task, which required tremendous clarity, consistency and presence. I've had my moments of feeling like a positive under-achiever compared to some of "those career women" whose children are at least as wholesome and well-adjusted as mine. And I do see myself "out there" at a "real job" eventually. It's just not yet clear when and how all of that will come together. SHOULD I MOVE ON, TOO? This is probably the more significant reason why the news of Ruth's new job pushed my buttons. There was a brief wave of anxiety, panic: Everyone is moving on with their life, and what am I doing? Once this was acknowledged, it didn't take me long to integrate the new arrangements into my life. I remembered that when two years ago, a career counselor had told me she thought I'd be working full time in three months, I realized I still wasn't ready to take that leap. But it did get me started studying sign language to become a simultaneous interpreter. Ruth started her new job and I continued with my teaching, my sign language, a grant proposal I was working on, and of course being a mom. And I can honestly say my seventy percent applause has moved up to one hundred percent. All of this having been said, I still think there is some childish, and albeit unreasonable wish in all of us for things not to change. And they always do, don't they? 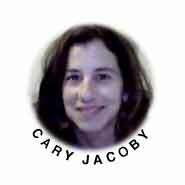 Cary Jacoby lives in a small rural community with her three children. She has an MA in anthropology, teaches English as a Second Language, writes, and used her sign language skills to document life histories of the deaf elderly.